Details of our next training courses will be shown here. The Hazel Dormouse is a protected species, which means anyone who regularly handles dormice needs to have a handling licence from Natural England. Members of SDG will be familiar with box checks being carried out under the leadership of a licence holder, who supervises all box checking activity. Those of you who enjoy participating in the checks under supervision do not need to apply for a licence, but for those of you who do want to apply for a licence, with SDG support, the following is important information. As well as attending certain training courses, people applying for a handling licence need a considerable amount of practical experience in working with dormice. This includes other associated activities, for example box and site maintenance and dealing with other box occupants. 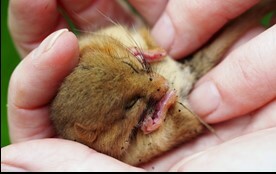 Dormice need to be seen at all stages, from pinkies to adults, and in various breeding conditions, such as post lactating. Given the small population of dormice this can take a long time, be prepared for it to take 2 or 3 years to gain all the skills and experience required to apply for a licence. SDG have put in place a managed scheme for people requiring handling licence references from the group. Any member of the group, who would like an SDG licence holder to train them, and be one of their referees when they apply to NE, must be registered as an SDG Scheme Trainee. They will have a named mentor, who is a licence holder within the group and who is there to guide them through the training, giving help and advice as required. The number of SDG trainees is limited by how many the mentors can accommodate and train to the high standard required. It is a rolling process, with spaces becoming available as trainees gain their licences. SDG trainees record their skills and experience on their PTES/NE Training Log but in addition complete a SDG Training Log, which has some extra requirements, such as leading a box check. Licence holders will continue to sign off any skills or experience gained during a check on the PTES/NE Training Log for non-SDG Trainees. 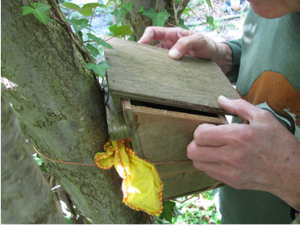 Our recommendation is that volunteers interested in being an SDG Trainee carry out box checks on a regular basis and gain as much experience as they can, using the PTES/NE Training log to record everything. At the same time, talk to the site leaders who are mentors and see if any of them would be prepared to take you on as a trainee when they have the capacity to do so. PTES web site has very good information on training, including some excellent videos.